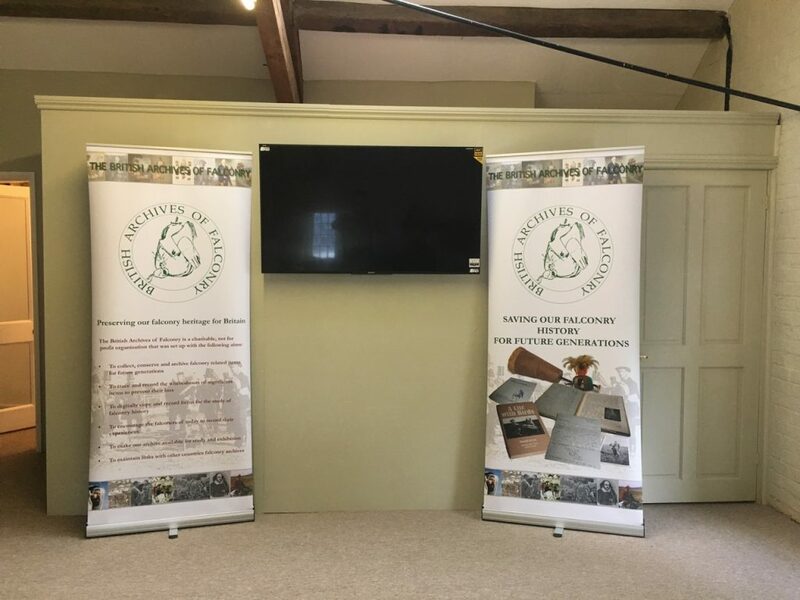 November 11th 2017 will see the official opening of the British Archives of Falconry’s new exhibition facility where items from their collection may be made accessible to falconers, academics, family historians and other interested parties. Run entirely by enthusiastic volunteer falconers, the British Archives of Falconry is a charitable trust which records and preserves items linked to the sport’s long and fascinating heritage in Britain; a heritage stretching back to at least 675 AD that has greatly influenced our national language, literature art and culture. 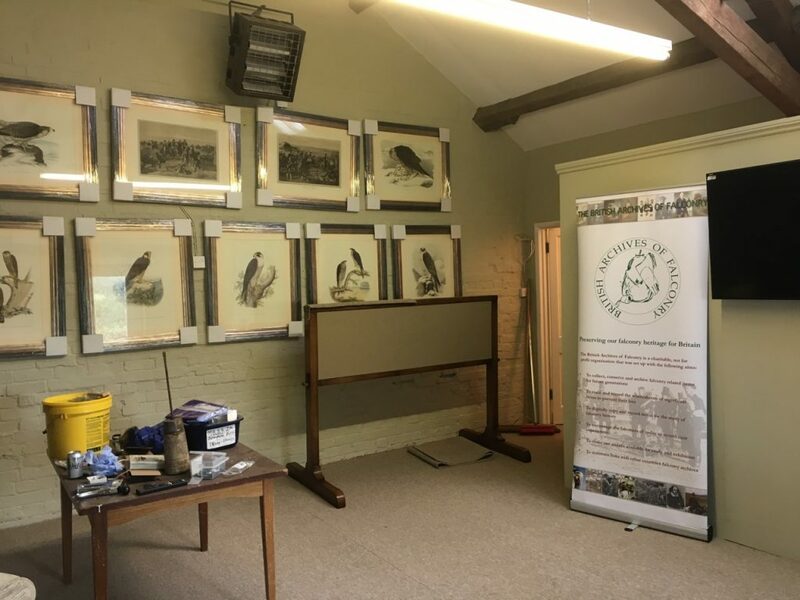 In the years since its inception, the Archives’ collection has grown immensely thanks to generous support and donations of material from the British, and international, falconry community – a community which values its history and cultural heritage. The collection encompasses items as diverse as sculpture and art, examples of old and more recent falconry furniture, hawking diaries and correspondence from well-known and less well-known falconers and already has an extensive collection of books, journals and audio-visual material which expands on an almost daily basis. The Archives has strong commitments to education about falconry’s past and present practice and heritage, which it strives to safeguard for future generations. As part of this role, it has an ongoing publishing portfolio encapsulating the organisation’s work in chronicling and preserving the memory of past falconers and their achievements for others to share, enjoy and learn from. The new facility, located in Wiltshire (a county with a continuous history of falconry from at least 941 AD to the present), will make this important collection more readily accessible in a pleasant setting conducive to both enthusiasts’ explorations and serious scholars’ studies alike. The date of the official opening is no coincidence, having been selected for proximity to World Falconry Day on November 16th, when falconers around the globe will celebrate their shared passion. November 11th was also the traditional date selected by early members of the British Falconers’ Club for their annual Falconers’ Feast, and thus has special resonance for UK falconry. This celebration of all that is special about our falconry heritage will host falconers from Britain and Ireland, Europe and further afield, and a number of guests with wider interests in cultural heritage and sport have been invited. Following the event, the exhibition facility will be open by appointment to anyone wishing to engage a little more deeply with a compelling and nationally significant heritage. It is with great sadness that we must announce the death of our past-president, Roger Upton MBE. Few have been so well-regarded in the falconry community the world over; his passion for our sport never abated, his knowledge was, to say the least, magisterial and was recorded in some of the best historical records ever written. He was a friend to many and a guiding light to us all. He will be much missed both here and in the Middle East where he had many, many falconry friends. A full obituary will appear in the next edition of The Falconer. I know I speak for the whole membership in sending our sincerest condolences to all of his family.